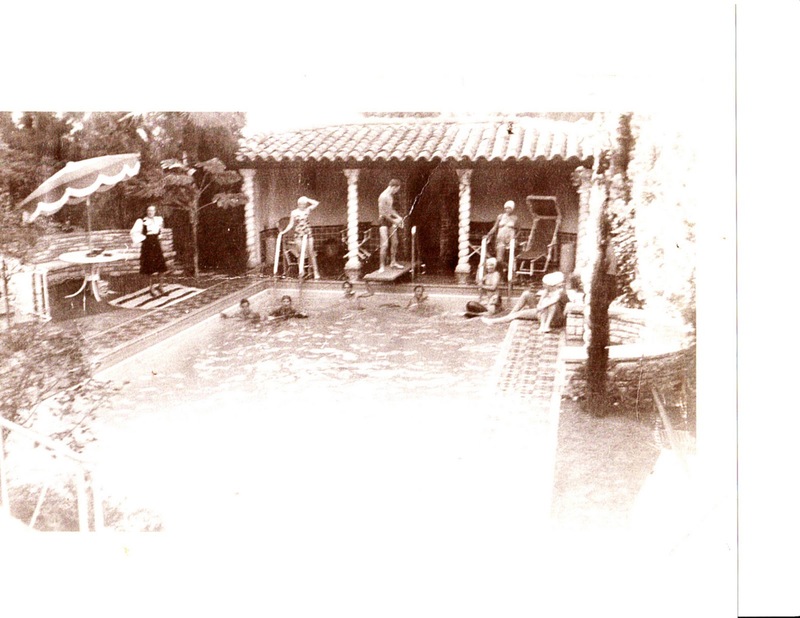 THE MAYBELLINE STORY : Life at the Villa Valentino in Hollywood, in the 1930s. Pool Party at the Villa Valentino with Evelyn Williams standing dressed to kill and Bill Williams on the diving board surrounded by friends and family. Tom Lyle and Emery are watching from the veranda. 1938. Tom Lyle and Emory led a quiet life in the luxury of the Villa Valentino, and didn't flaunt their relationship. In the 1920's and 30's people didn't care much if somebody was gay as long as they kept a false identity in public. In Chicago Tom Lyle and Emery stood out, gossip circulated about them wearing a hint of Maybelline, wearing expensive suits, driving flashy custom made cars and sporting pencil thin mustaches. They didn't fit in the Midwest, but Hollywood was different, it offered tolerance and acceptance. Tom Lyle could be comfortable at the Villa Valentino with Evelyn and Bill around him, and he invited some of the biggest stars in Hollywood to his sanctuary where he contracted them for Maybelline ads. Read more about the Villa Valentino, and Tom Lyle's love of beautiful automobiles in The Maybelline Story, and check out Sharrie Williams at the Sanctuary Resort in Arizona talking about her cousin Chuck Williams upcoming visit to the Barrett Jackson Classic Car Auction next week. He will be discussing his great uncle Tom Lyle's love of cars while at the show, as well as his personal car collection - as he follows in his great uncles footprint. the video will be on the blog to enjoy at that time.